the swiss manufacturer ‘thorens’ are historically renowned for their high quality components. today, the company produce a solid range of turntables and audio playback equipment (you can see their classic td160 in my previous post record table). but when founded by hermann thorens in 1883 their main focus was in producing clock movements, music boxes and most successfully, petrol lighters. in total 5 million thorens pocket lighters were produced from 1913 to 1964. their first lighter in the range was their greatest success and i’m a proud owner of one of these “standard original” models from 1920.
ive owned this thorens single-claw semi-automatic lighter for just over a year and it works probably just as well as it did when it rolled off the production line. however, it was showing the visual signs of 90+ years of action: the wick had disintegrated to a stub, the chamber was lined with flint dust and the outer body had lost some of its brilliance. it was a due a service. in the process of disassembling and cleaning each component i learnt more about what makes this lighter a truly beautiful product. its an unusual design – a natural, silky metallic shell punctuated with small, very man-made details. the original models like this one are noted for the reservoir stopper on the side of the body. its quite exposed and you can see the nickel plating on the ring has worn down to the brass. later models integrated the stopper to sit flush in the base giving it a sleeker finish. however practical, this design change removed a lot of the lighters visual charm and overall appeal. 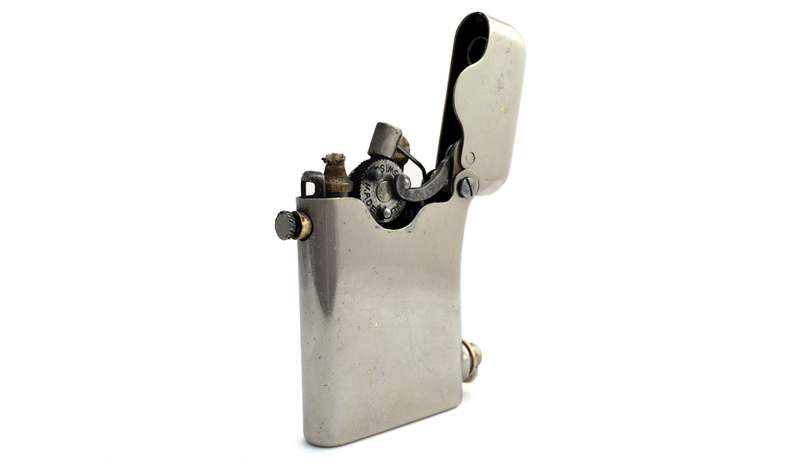 the thorens is a button-actuated automatic lighter. there is a safety mechanism to prevent it from accidentally going off in your pocket and ruining your day – simply unscrew the knurled disc at the front and the button unlocks. from here, one quick press and the spring-loaded lid clicks, snaps and throws up a flame in one sweep. when you’re done, closing back the lid reloads the spring and extends the clawed arm to grasp the next nib on the flint wheel. its a clever movement that needs to be seen, touched and smelt in person to fully appreciate. the arm positions are brilliantly illustrated in the original patent drawings from 1920.
every curve, kink and angle in the mechanism is beautifully designed to fall into position right at the correct moment. up close you really get to see how much thought went into its design. the thorens name and other markings are hidden away, stamped into the base. one final nice feature: the stopper is threaded with a rubber ring to create a nice tight seal around reservoir and prevent evaporation. twisting the stopper reveals a handy place for storing an extra flint. this thorens lighter embodies all of the things i like in a great product. of course its a lighter but its also beautiful, well-made and built around an honest design. i dont know who originally owned it (probably neither does the collector i bought it from) but its a joy to hold, to use and to own. this product is designed to last and has done so for almost a century. hopefully it will be shared and used for even more years to come.